I got quite a bit of cooking done this month, and managed to try out three new recipes to share with you. I.E. “lamb stew, I think”. 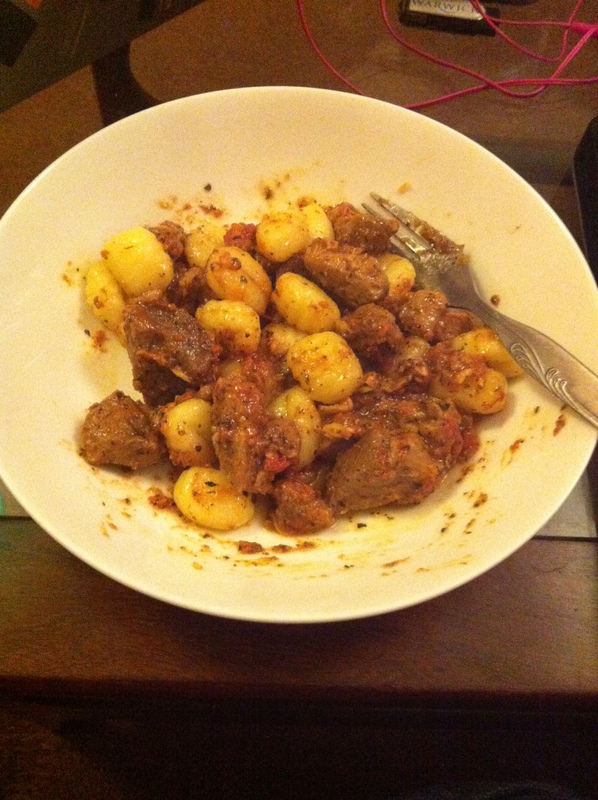 This one was a Jamie Oliver recipe, and I actually stuck to it pretty closely – but I just used pre-diced lamb instead of buying a leg and cutting it up, because seriously I don’t have the time or skills to do that. As a result I also used 1.2kg of lamb instead of 2kg, because a) lamb is more expensive than most of the things I eat and b) I was assuming that the recipe was accounting for some amount of wastage in carving up an entire animal leg and removing the bone by yourself. Also, I served it with store-bought gnocchi rather than chips because that sounded both healthier and, frankly, tastier. The hardest part of making it was making the garlic paste. I do not own a mortar and pestle and had apparently not noticed that the recipe wanted you to have one, so instead me and my partner took turns doing some champion mashing with a wooden lemon squeezer we found in the back of a drawer. Finding random cooking implements you didn’t know you might need is one of the great joys of living in a rented flat. But it was so worth it. It tasted great, and it was a combination of flavours that was new to me. As someone who, I suspect, like most novice amateur cooks, learnt starting with italian pasta sauce dishes and then just kind of kept making them, I find that a lot of my red sauce dishes have most of the same flavour notes in them, so this was excitingly different and full of savoury punch. It made six portions, and I still have one waiting in the freezer for me for next week. The leftovers that I have already eaten reheated just fine in the microwave and tasted just as nice over a fresh batch of whatever you’re serving it with (I imagine that you could use pasta or rice instead of gnocchi, and that potatoes in some form would also be perfectly nice). This one came from a community recipe on the Nigella Lawson website. As I type, there are still a half dozen or so left at the bottom of the very same tupperware box pictured, waiting to be enjoyed. 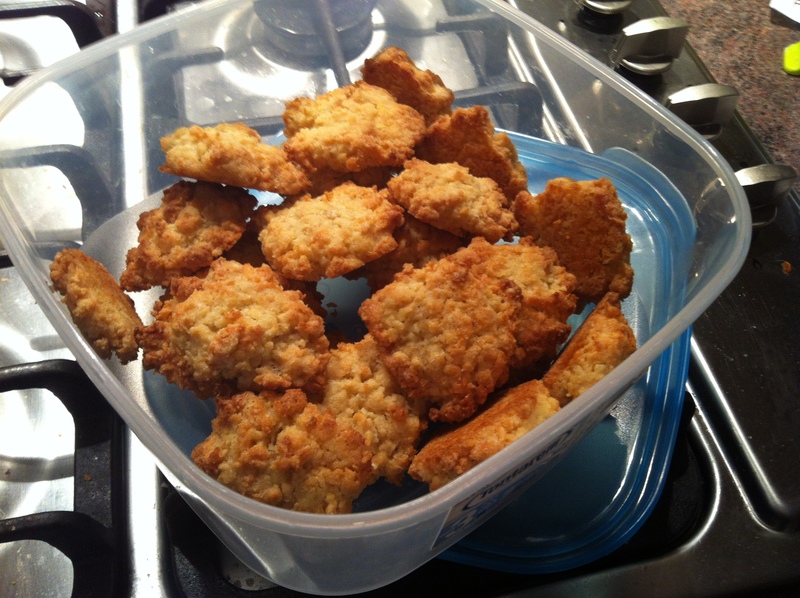 There was… somewhat of a disaster the first time we tried to make these. Since I cook a lot of Nigella recipes I thought I’d be clever and substitute the self-raising flour with plain flour, bicarbonate of soda and salt, not realising that baking soda makes biscuits taste absolutely horrible if there’s nothing acidic in there to balance it out. So I trekked out, got some more coconut and some actual baking powder (i.e. baking soda with the acid built in), and tried again. As I wasn’t sure what kind of sugar to use, I used 1/3 cup of brown sugar and 1/3 cup of white. I imagine it would taste fine with any combination, or with the full cup of sugar suggested by the recipe, but as I made them they turned out fine. They’re still very sweet, but not overly so, and are particularly nice at the sweet spot of the first few days after you’ve baked them, when they’ve cooled and hardened into crunchiness but are still fresh. This one was a Frankenstein recipe – it came mostly from another Jamie Oliver recipe, with some tweaking inspiration from this awesome looking Cooking Jar recipe as well as a couple others I looked over to figure out how to add the titular broccoli that have been lost to my browser history. I added broccoli instead of leek, and because I wasn’t frying the leek and then evaporating liquid into it I decided to make a roux base instead. I added flour after frying the garlic in butter, then added the wine, stock and cheese to make a creamy base. I also used mascarpone instead of ricotta (since I couldn’t find any ricotta in the Tesco), and added a mozzarella ball to get closer to the stringy cheese texture of the Cooking Jar recipe without buying more fancy cheese and cream than my budget can handle. And it tasted great! 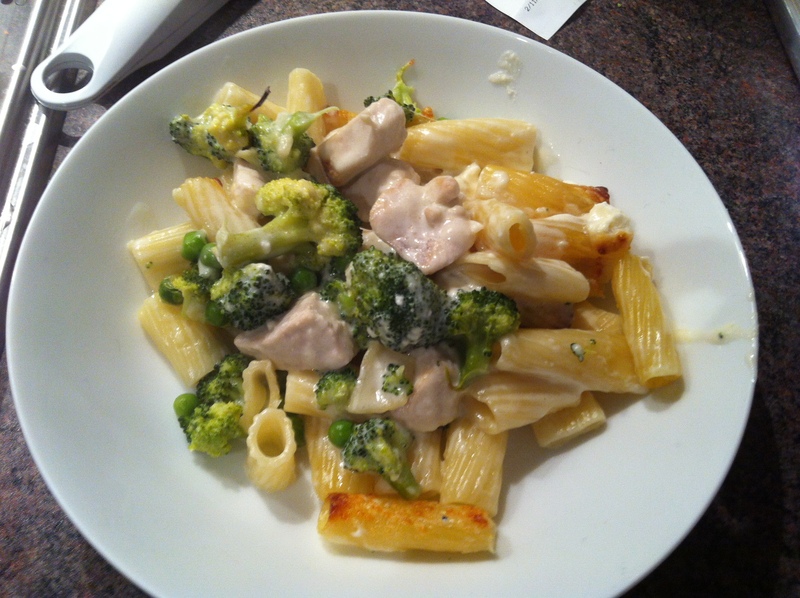 The chicken was probably the odd ingredient out here, since it didn’t succumb to the creaminess in the way the broccoli and peas did – possibly because I cooked fresh chicken in chunks that were a bit too big to do that instead of shredding pre-cooked chicken like the recipe wants. It made six portions. I put the leftover portions into foil-lined tupperware boxes and wrapped them in, then reheated them in foil parcels in the oven inside the baking dish. It can take a while to reheat through, especially if you’re cooking a double portion like I was, so the next time I make it I may seal all of the portions into individual foil parcels and just cook as many as I need at a time so they heat throughout in less than 40 minutes. I did intend to take a picture of last month’s reads, but the idea to do so came to me after I had already returned The Red Tree to the library. 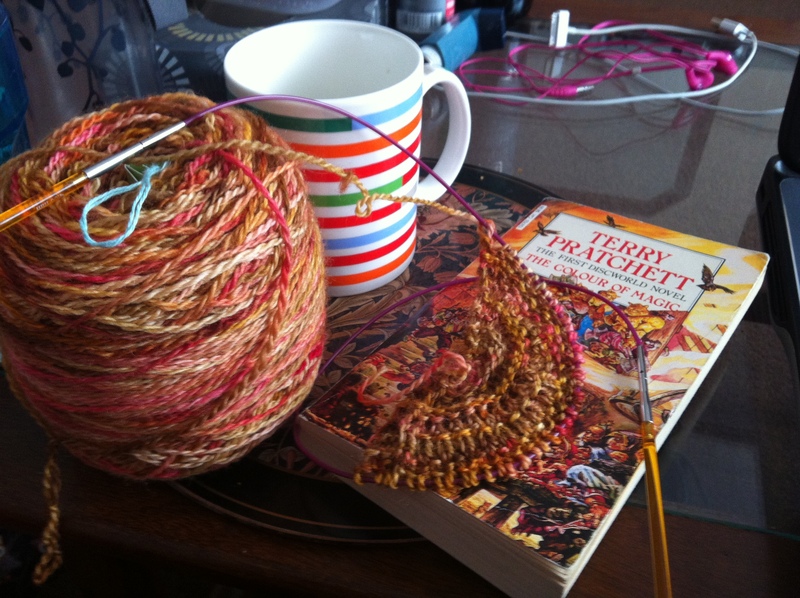 Instead, here is a picture of my other read next to a shawl I’m knitting. There are a lot of colours in it, but none of them are actually red. I know, I’m an eternal disappointment. Anyway. The Red Tree by Caitlin R. Kiernan – I loved this. I was recommended it ages ago and decided to finally go for it when I found it in the library. It has several of my favourite things in it – it’s a New England horror story told in the style of a diary left by a deeply self-loathing writer who moves into a farm cottage to attempt to finish her manuscript after the death of her girlfriend. Very creepy, blackly hilarious and the kind of book I enjoy even more as a writer who can, perhaps unfortunately, empathise. The Colour of Magic by Terry Pratchett – I’ve read this before, but I’m starting a Discworld book group with my friends, so I’ve reread it. I never got terribly far with Discworld, so this doesn’t have the wow-so-different feel I know some fans of the series find on a reread, but – I enjoyed it. Even thirty years after publication it’s still hilarious. I’d forgotten it was written as interlinked short chunks rather than a cohesive whole – but it somehow adds to the feel of it, the unusual structure reflecting the older fantasy novel it parodies. In writing news, I bit the bullet, and finally sent a lit.fiction story I’d been working on to a magazine. One of the recently successful graduates from my Creative Writing alma mater is Kirsty Logan, whose early blog is a tally of how many short stories she’d written, sent off and received acceptances & rejections for. This… will not be that kind of blog. I write short stories far too sporadically for that to happen. I have a science fiction short story that I feel needs just-one-more-draft, so if all goes well I’ll be telling you about sending that off too in a few check-ins time.